I left Daughter of Smoke and Bone feeling a little disappointed about the love story, but wanting to know more of Karou and Akiva's story, so I picked this one up as soon as I could. Thankfully, I'm rather late on the bandwagon for the Daughter of Smoke and Bone books, so I can pick up the next part whenever I like. This is probably a good thing as I'm already starting to forget what happened in Days of Blood and Starlight, which wasn't a whole lot. It started out great and I enjoyed the ending too, I can't wait to find out what happens next. When I started the book it seemed that Karou had disappeared, leaving Akiva and Zuzana wondering what the hell must have happened to her. I loved this section of the book the most, as it had a lot of mystery and I got to know some new characters, who were Chimera. There's a few different points of view in this story but I never found it confusing. There's the main characters, Akiva and Karou, then there's a few chapters from Zuzana and even a couple of chapters from minor characters. I really like this idea because it give me a better look at what was going on in the world of the Chimera, from the Chimera themselves. I think my biggest problem with this book was actually reading it - it's over 500 pages long and feels even longer, as not much happens. If I had to compare it, I'd compare it to Order of the Phoenix - except that I'd prefer to read Order of the Phoenix because it had a much more interesting storyline. 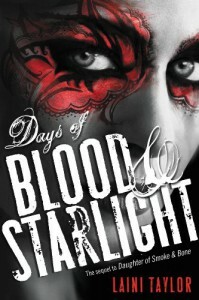 In Days of Blood and Starlight, it's mainly focused on Karou, who's making dead soldiers come back to life. That's basically all she does for the entire book. This plot could easily have been shortened by 100 pages. The romance here is almost non-existent, because Karou is seriously pissed at Akiva. They're not together for most of the book, as they're fighting the same war, on different sides. Yes, you can smell Romeo's sweaty armpits a mile off. 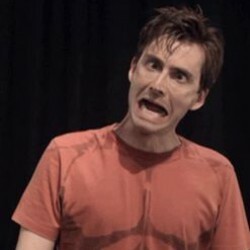 I was worried about a potential love triangle but that was soon squashed. And then a potential new one popped up. The ending was good, nothing happened that I didn't expect but I was glad that I'd got to that point, so I could finally finish it. I'm hoping that a lot more happens in Dreams of Gods and Monsters and it does seem to have of potential.